Mason Parrish once asked his father, writer/director Chris Parrish, if they could make movies together when he grows up. Chris said, "Of course." Making Thrill Ride, the award-winning family-adventure movie from Mason's Movies and distributed by Gravitas Ventures, is Chris' way of keeping that promise. The film is available on DVD, streaming, and video-on-demand via Amazon, iTunes, Target.com and pay-per-view. 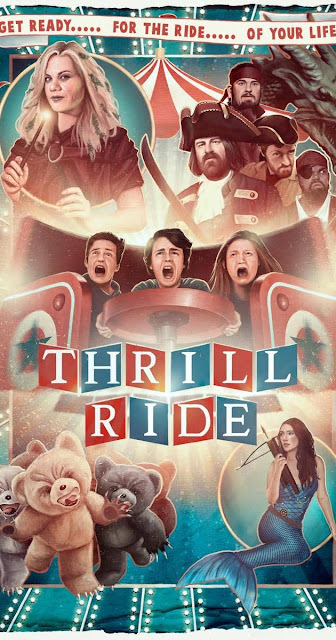 Thrill Ride is a Mason's Movies Production, named after writer-director Chris Parrish and co-producer Ilisa Parrish's son, Mason Parrish, who passed away at age ten in 2011 from a rare form of pediatric brain cancer. Mason thought of the idea for Thrill Ride and he and Chris began brainstorming. Neither were big athletes. Fathers and sons play catch, but for Chris and Mason their catch was pitching ideas to each other for stories. They kept doing that even after Mason was diagnosed with brain cancer. The disease "took away so much from Mason," said Chris. "But it never took away his creativity."